Simple. 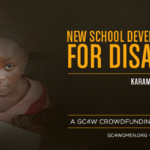 It’s a campaign initiative to help bring an education for the disabled girls in Karamajiji, Abuja, Nigeria. The Global Connections for Women Foundation (GC4W) is committed to building new classrooms, providing a school bus, tables and chairs, school supplies, and clean water supply – to further ensure the success of these girls. That’s why we want 20,000 beautiful human beings to donate $5 each, to raise a total of $100,000 for these girls. They deserve an education and we want YOU to give it to them. Currently, Karamajiji offers NO facility or structure for the education of its children. WHY? The village is home to a growing population of disabled people. In Nigeria, disabled people and children are deemed unimportant, therefore, there is little to zero funding for them. 100% of the money raised from the #FiveforFive campaign will benefit the disabled girls in Karamajiji by bringing them access to clean water and education. According to UNICEF, 40% of Nigerian children aged 6-11 do not attend any primary school with the Northern region recording the lowest school attendance rate in the country, particularly for girls. It is estimated that about 4.7 million children of primary school age are still not in school. Girls’ education is a huge challenge in Nigeria. The gender gap remains particularly wide and the proportion of girls to boys in school ranges from 1 girl to 2 boys to 1 to 3 in some States. Specifically, children with disability are almost invisible and are often excluded from schools and opportunities to work. This is because of the social stigma and traditional beliefs associated with disability that surrounds them. Children often grow to a future of begging as the sole means of survival. Because people and children with disabilities are seen as less of a priority, places like Karamajiji has very few facilities for proper educational training for their children. DONATE $5! Rather than spending $5 on something that can be easily consumed, such as a $5 latte, spend $5 on #GirlsEducation in Karamajiji, Abuja, Nigeria. Your donation will create a LIFETIME of education for disabled girls. Spread the word. Reach out to at least 5 friends in your community and social networks so they know that just $5 can change multiple lives in Nigeria. Then, ask them to share with 5 of THEIR friends. You can use hashtags such as #FiveforFive, #GC4W, #GirlsEducation, #LetGirlsLearn in your posts and mention @GC4Women and @GC4WEvents! Don’t forget to share our GiveForward link: bit.ly/1eRwd8v. The more people that know, the more likely we are to raise funds! If you would like more information on the #FiveforFive campaign or to learn more about the GC4W New School Development Project, please contact us at info@gc4women.org. Macy’s selects GC4W as a Beneficiary of their “Shop for a Cause” In-store Event.